So–I left Baltimore in the middle of August 2012, after six weeks of uber-busy Parallel-Octave-filled movie-making action. In all this time, I didn’t manage to make a single movie of my own, despite co-teaching a short film class with D., producing 26 shorts in the supermegafilm (ANTHOLOGY II) and the screening in which all of those 26 things appeared. It was a busy summer. A good one, but a busy one, and, really, there wasn’t space or time for me to make a film of my own. 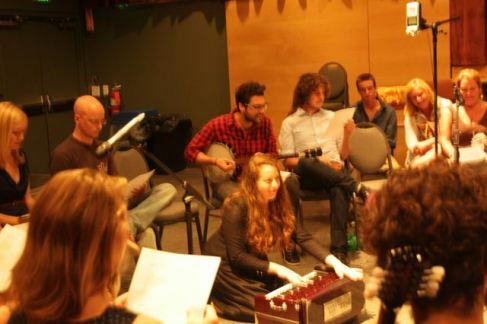 Poem-recording session at the Creative Alliance, following the screening of ANTHOLOGY II. 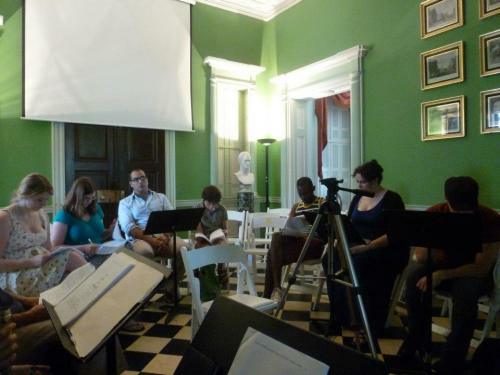 Rehearsal for “To Die in Athens” at the Homewood Museum. August 12, 2012. There is something about hanging out with A. that makes me feel like I can do things like shoot video. In fact, the only time previous to this that I shot some was also with A., at J.’s wedding, when we stumbled onto a massive theater at Swarthmore where someone had taken all the lights off the grid. I walked among them filming them and was like “I’m going to do something with this.” I haven’t. Yet. You’re going to make me lonesome when you go. Today, I’ve only just managed to finish putting up most of the ANTH II films on YouTube (uploading time–something I really didn’t manage to multiply by 26 in my head) just in time for ParOct’s first Baltimore session of fall 2012. They’re recording poems about escape; poems I chose. Here is one of those poems: The Fascination Of What’s Difficult. Stay classy, ParallelOctiBaltimore. Someone is thinking about you in Poland. And just because it’s difficult doesn’t mean (a) it can’t be done (b) it stopped Yeats, or anyone else, from trying. But you know that.